Last week saw the third of the so-called “fire sale auctions” in Ireland in recent months. While there are those who are set against these types of auction, viewing them as some sort of return to the evictions which haunted the Irish countryside in the 1800s, most see them as the crystallization of what everyone knows, i.e. that property prices have fallen dramatically in Ireland over the last five years. There are those, such as myself, who believe they offer a unique insight in to real transaction prices. 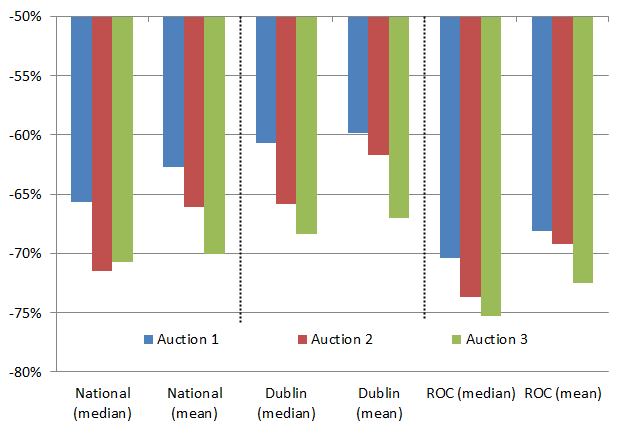 In particular, on previous occasions, I’ve used the model of the Irish property market that I’ve developed for my academic research (which is related to the model that underpins the Daft.ie Report) to see what we can infer from these auctions about exactly how far Irish property prices have fallen and where the fire-sale prices are relative to current asking prices. In this post, I’ll do the same analysis on the sixty or so residential properties sold last week and I’ll also take stock of the three auctions so far, and see if there are any trends. This third auction, while still very successful in an international perspective, did see a number of properties not sell – a fuller report is given over on NAMA Wine Lake. Some were very close to their reserve and will probably sell when the dust settles, while it seems for others there just did not seem to be the appetite. For those that did sell, prices ranged from less than €50,000 for apartments in Limerick city or a four-bed semi-d in Athlone, to more than €250,000 for family homes in Drumcondra and Blackrock. Of the 61 properties included in this analysis, 38 were existing investor opportunities (i.e. with tenants in place). This is extremely useful as the information on current rents gives us information on the rent-price relationship, which is one of the most important in the property market –I’ll return to this later. First, though, I put all the properties through the housing market model, building them up component by component to get an estimate of the asking price for each property at the peak and now. This in turn gives an estimate of how much each property that sold has fallen from the peak. This ranges from 46% to 83% but one must be careful that there will always be a few “exceptional” properties (in either a good sense or a bad one) so it’s better to look at the mean and the median than either end. According to my analysis, the typical fall from the peak for the properties sold last week is 70% (mean, 71% median). This can be broken down into Dublin and Rest-of-Country (ROC), with Dublin prices down by two thirds (67% mean, 68% median) and prices elsewhere down by a pretty astonishing 75%. This is the third auction in a row where that gap between Dublin and the rest of the country is there – and it’s worth noting that this gap is the reverse of the trend seen in asking prices, where Dublin has seen the largest falls. 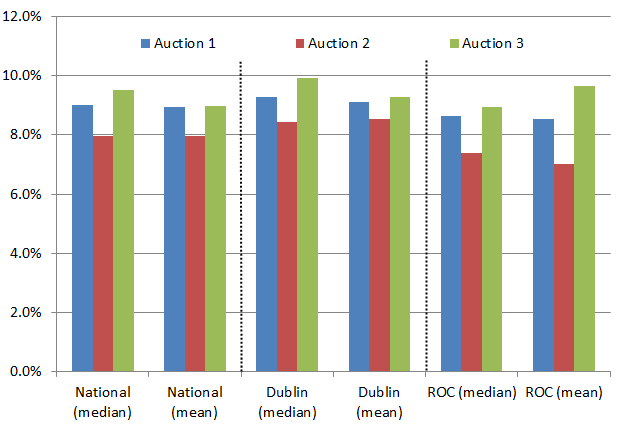 That median fall in Dublin of 68% compares with 66% in the second auction and 61% in the first fire-sale. Similarly, the 75% median fall outside Dublin is just above the 74% seen in the second auction and a few percentage points larger than the 70% falls seen in the first fire-sale. These figures – for both the mean and the median – are shown in the graph above. Conclusions from the first two analyses showed that there was a noticeable gap between the fall in asking prices (40%-50%) and the estimated falls seen in the fire-sale auctions (65%-70%). That gap is still there – asking prices are probably 45%-55%, while fire-sale prices are 65%-75% – but what has emerged is another conclusion: prices are falling across the auctions. A slightly different picture emerges when we look at yields, rather than price falls. I mentioned above 38 properties with rental information. On those 38, the typical yield was about 9.5% (median, 9.3% mean). For the first time in three auctions, the gross yield (annual rent as a proportion of the price) was noticeably higher outside Dublin than in Dublin. This is quite interesting, as it’s the first time in three auctions that it matches the prior belief that the “risk premium” is greater outside Dublin (where the downside to rents is greater). The typical yields achieved over the various auctions are shown in the graph below. Unlike the graph above, there’s no obvious up or downward trend. One thing that is clear, though, is that comparing the July and September auctions, especially outside Dublin, the yield has increased. Put another way, to tempt the cash out from under mattresses, people now need to see effectively a double-digit return (pre-tax). Two weeks ago, I wrote about Ireland as the unwanted experiment, a modern economy trying to run without any credit. As outlined then, there are serious effects on job creation when there is a lack of credit available to small businesses which could be hiring and selling their wares on international markets. I made mention then that this is just one aspect of credit starvation: the other big one is couples with jobs not being able to get a mortgage. But the results from Friday also show that the lack of credit is having an effect even in property market fire-sales. Ireland appears to be running out of cash-buyers for properties located here. One could of course make the case that there are plenty of alternative asset classes for people to invest in. Even taking into account the remaining downside risks to Irish property, it does seem odd that gross yields of almost 10% are not enough to attract investors out of the woodwork, particular as developed economies typically hold up to three quarters of their wealth in real estate. So, rather than some odd preference shift away from property, I think it’s much more likely that Ireland’s credit crunch is kicking in, even among the investor class. Interesting. Maybe investors are waiting to see what NAMA does. Also, what’s going to happen regarding repossessions? Doesn’t help that the price of apartments is plunging. Could the latest extremely large prices falls, in particular for Dublin apartments, be as a result of the achieved yield indications from the 3 latest auctions? The latest Daft report has Dublin yields ranging from just 4% to about 6.5% but this is still well below the auction yields of over 9%. Rents have been static over the last 12 months but with the likelihood of rent allowance reform in the December budget we could see further pressure on rents over the next few months. This would suggest non auction prices still have significantly further to fall to get close the yields achieved at auction. I have tried to compare the auction sales price with the asking price of the exact same property or a similar one from close to the peak. Results are similar to your own analysis showing that prices are down about 67% from peak. Very interesting analysis of prices. I see you are placing some store in yields which is understandable but I wonder of yields at present are a bit of a distraction. With Upward Only Rent Review legislation due for publication shortly which will lead to a decline in commercial rents and with the sign-posting of cuts to rent assistance payments which can only put pressure on private rents, I wonder if yields on auction firesale prices of 9-10% are a reliable guide? Hi Jagdip, thanks for the comment. In my own opinion, I think residential yields – which are the only ones I’m looking at here and during previous auctions – are a separate market (but not completely obviously) to commercial yields, for the regulatory reasons you point out. On upward-only rent reviews are very different to new leases. I would pay next to no attention myself to yields on old leases and almost all my attention – from a commercial property perspective – on what yields on new leases are indicating. In relation to rent allowance, I think the issue there is pertinent for 1-2 beds in particular. It is in those segment, if anywhere, where the price floor is binding. Nonetheless, I remain to be convinced that the bulk of landlords advertising on daft.ie, who will not even entertain rent allowance applicants, are going to change their mind en masse when rent allowance goes 5% above market rents for their properties. Still, this property market has many surprises up its sleeve the last few years, I’m sure there are a few more. Interesting analysis Ronan. A potential problem with your comparisons with prices at the peak of the market is that it is not clear that they are like-for-like. The catalogue for the auction shows that some of the houses were investment properties with tenants at impossibly low rents. For example, some were big houses divided into flats where some flats had annual rents of 8-9K, whereas others had annual rents of 1-2K. The latter suggests that there are sitting long-term tenants on very low rents who would be impossible to remove, and probably cost more in taxes and maintenance than they bring in in rent. These were the properties with the really low prices and the really high yields. More generally, there is a tendency to sell “problem” property in auctions, in the hope that some naive buyer will purchase it in the heat of the moment without checking it out properly. I think everyone saw the post from the guy on askaboutmoney who bought the property with the title problem in the first auction, and was astonished to discover he had no come back. This suggests that the average property sold at auction is much more likely to have title, planning, sitting tenant, structural, or other problems, than a house sold by the normal route. It’s just not clear to me that the prices of these problem houses can be compared to the prices of other, non-problem properties. Perhaps the penny is finally beginning to drop. I notice that your commentary on rental yields in relation to residential properties is becoming the real guide to where property prices are likely headed. I don’t want to come across smug or part of the I told you so brigade but I’ve been blogging this message it seems ad infinium for the past number of years and it seems like the message is now getting through. I say it again The only reliable long run metric to value any property is to base the price of its long run average net rental yield. The long long run average net rental yield in the RoI since records began is about 6.98% ~ 7%. This equates to about 14.3x times current net rentals as a guide to pricing. At the peak of the boom in large D4/D6 dwellings the multiple got to 100x rentals. Crazy or what? Given that the property market is like any other risky asset market in that it exhibits all the known characteristics of mean reversion over time the market net yield will get to 7% – that’s a given – on that basis using the Daft.ie top of the market rental yields the minumm peak to trough falls will be 67% for the market as a whole. As indicated this is the MINIMUM PTT fall that we are likely to see. Anyone (including the Central Banks PCAR numbers) will be proven to be wrong over time. I don’t have a crystal ball to make this prediction its simply a case of reading the history and understanding the long term dynamics of the market. Roana, you are right the rental yield on newly purchased property is fantastic now. For a Euro 100,000 investment you get 8,500 per year on rent. Compare that to a gross 2,000 per year on deposit before DIRT tax. Its never been a better time particularly as the rental market is proving strong in the absence of sales. SO WHAT WRONG? I agree with you that the Banks are starving potential purchasers of credit. The buy-to-let market is being particularly badly hit. For example its almost impossible to get a loan to buy a one bedroom apartment in central Dublin – even though these rent really well. So property will continue to languish until the government force the banks to lend out the money they have been give by US, the taxpayers.